Sala Loy Kaew is the enjoyment of this season here in Thailand. Carved salacca in sweet syrup and lots of ice makes a perfect treat when it’s boiling hot. Here, we combine the dessert with our crafted cold brew through infusion. 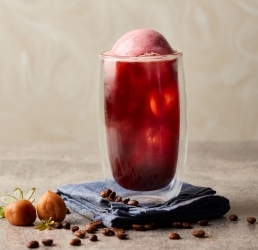 The tarty taste of roselle-strawberry-infused coffee is balanced out by the subtle saltiness from roselle-ume sorbet. 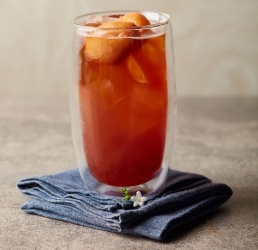 Together, their different tones of sweetness complement our signature cold brew with complexity, making a perfect icy, fizzy treat for Summer! 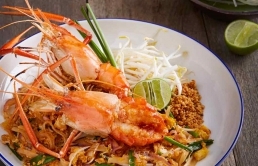 What could be more Thai than Pad Thai? Cooked with giant river prawns for an extra savory experience. Taste the world-renowned Thai dish Tom Yum with a surprise! 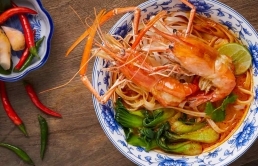 A giant river prawn in a spicy, herbal soup will guarantee you an authentic Thai culinary experience.